Since then, the legal wrangling has gone back and forth, with evidence gathering and rival motions. In September, a media firestorm erupted when depositions given last April by Thicke and Williams were made public. Most recently, on October 30, a federal judge concluded that the case will need to go to trial. Pharrell and I were in the studio and I told him that one of my favorite songs of All Times was Marvin Gaye’s ‘Got To Give It Up” I was like, “Damn! We should make something like that, something with that groove,” then he started playing a little something. We literally wrote the song in about a half hour and we recorded it. While media headlines fixated on revelations about Thicke’s admission of substance abuse issues and romantic travails, we’re more concerned with what the story means for musicians and composers. Performers receiving credit and payment for a part of the creative process that they may have had nothing to do with? And the revelation that this is currently normal in the mainstream industry? It’s impossible to really know just how pervasive this practice is, but Pharrell’s claim that it’s fairly common jibes with what many industry observers have anecdotally heard over the years: many big-name acts routinely claim a share of the songwriting substantially larger than their actual contributions. Why would a performer take songwriting credit that they didn’t earn? There’s a few possible reasons. Thicke points to his own ego as a factor: “After making six albums that I wrote and produced myself, the biggest hit of my career was written and produced by somebody else and I was jealous and I wanted some of the credit.” This may not be an uncommon justification, as in this current era of pop hitmaking, many stars have carefully constructed their images as auteurs who bear principle creative responsibility for all their output. Perhaps another factor is money. Claiming songwriting credits means that Thicke gets an automatic share of the mechanical royalties from every sale of the song, in addition to the contractually stipulated royalty rate for his performance. And for a song like “Blurred Lines” that ends up being a huge hit on commercial radio, the financial reward paid out by PROs could be significant. Remember that because of a loophole in US copyright law, AM/FM stations are only obligated to pay songwriters and publishers, not performers or sound recording owners. This puts us out of step with most of the developed world (with the exception of North Korea & Afghanistan) and means the only way Robin Thicke would get paid at all for all those FM radio plays is by claiming a part of the songwriting credit. If a superstar performer requests a share of the songwriting credit greater than their actual contribution to the song as a condition of a song’s release, songwriters may not have much choice but to consent to taking a smaller cut. If that’s what it takes to land a song on a Beyoncé record, for example, many songwriters would conclude it’s worth the sacrifice. This is probably of less concern to someone like Pharrell, a superstar performer in his own right with significant negotiating leverage of his own; he can afford to be generous. But for many songwriters who only work behind the scenes, this practice could amount to a serious reduction in their overall earnings. And it’s worth remembering: songwriters don’t typically get a cut of merchandise sales and endorsement deals the way featured performers can. Are there solutions? Well, one obvious fix would be to close that loophole allowing AM/FM radio to avoid paying performers when their music is played. Eliminating the performance rights exemption would mean that performers would be compensated for radio plays of their song, and wouldn’t have to encroach on the songwriters’ earnings to get paid. (Paying performers is also, quite simply, an issue of basic fairness, as we’ve noted many, many times.) Numerous legislative attempts at addressing this problem have been made over the years, and we wouldn’t be surprised to see it come up again in the 2015 Congress. Whether or not the Gaye family’s allegations are ultimately found to be true, the case does raise questions about the role of major publishers in an ever-consolidating music industry, and how effectively they can serve their various songwriter partners in cases where their loyalties may be divided. Submitted by Bill Thomas (not verified) on November 21, 2014 - 1:25am. 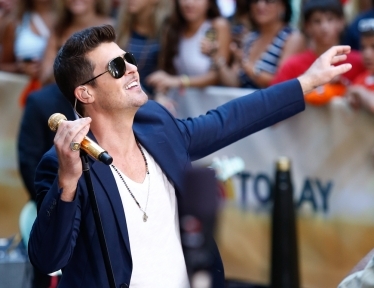 You have missed out an a source of income that can be even more important to Robin Thicke. By claiming an exaggerated share of the songwriting credit, he will also receive performing rights organization income through ASCAP, BMI and SESAC. For a big hit like "Blurred Lines," this will total in the millions. Full disclosure: I was Director of Public Affairs and then Chief of Staff for ASCAP for 14 years, 1990 to 2004. Submitted by MIchelle Davis (not verified) on December 11, 2014 - 9:38am. This has been going on for a very long time. Elvis wouldn't sing your song unless you gave him part of the songwriter credit. There were even DJs in the 50s/60s who would demand songwriter credit as part of the whole payola scheme...Like Alan Freed getting co-writing credit for "Maybellene." Submitted by Anonymous (not verified) on December 11, 2014 - 5:18pm. How did Robin know that song would be a hit? It sounds like he had the foresight to ask for shared credit months in advance. Soothsayer or not, still a marginally talented puppet.